AA is an international fellowship of men and women who have had a drinking problem. Living Sober is a practical 90-page booklet that demonstrates through simple example how A.A. members throughout the world live and stay sober one day at a time. NA is a global fellowship or society of men and women for whom drugs had become a major problem. We are recovering addicts who meet regularly to help each other stay clean. This is a program of complete abstinence from all drugs. Work the 12 Steps and discover the path that will change your life, enrich your recovery and bring you closer to the heart of God. Developing skills to deal with self-destructive coping behaviors. The true goal of anger management isn't to suppress feelings of anger but rather to understand the message behind the emotion and express it in a healthy way without losing control. Invitation only. A Biblical path to resolving conflict. Focus on the brain and the way active addiction changes the body; discussions on perceptions of experience. Basics of Mental Health vocabulary, theory, and application. Peer support focused on treatment courts. Mental health topic oriented discussion focusing on skills for achieving and maintaining recovery. Self-Help open discussion on recovery in daily living. A group to explore various means of recovery. Self-Help based on changing your thinking. Recovery methods derived from evidence-based addiction treatments; secular and scientifically based using non-confrontational, motivational, behavioral, and cognitive methods. A guide for recovery from alcoholism written in layman's terms. Skills, recipes, and budget development for cooking in recovery from Chef Sean Jones. Resume building, interviewing, and job search techniques. Learn how to use knitting to improve your wellbeing and support your recovery. Meditation skills and group meditation. A group for people in recovery, led by Jen Raines, exploring recovery in mind, body, & soul. Recovery program based on Buddhist principles of mindfulness and meditation. Focuses on developing skills to heal trauma for people in recovery. Trauma group using poetry and self-expression to find healing. Focuses on developing skills to heal trauma for people in recovery. Men only. Focuses on developing skills to heal trauma for people in recovery. Women only. Parents who have experienced the tragic death of a child. Invitation only. Parenting group presented in association with CASAC. Invitation only. Support group for empowering the family unit. Support for families and friends of those in recovery. A gender specific open topic on varied subjects. Women only. Mental health and chemical dependency peer support for veterans. Veterans only. A support group for people who have struggled with suicide attempts or thoughts. For more information: ats@mhachautauqua.org. A wellness group for the LGBTQIA+ community to support your peers through resources, acceptance, and stories. 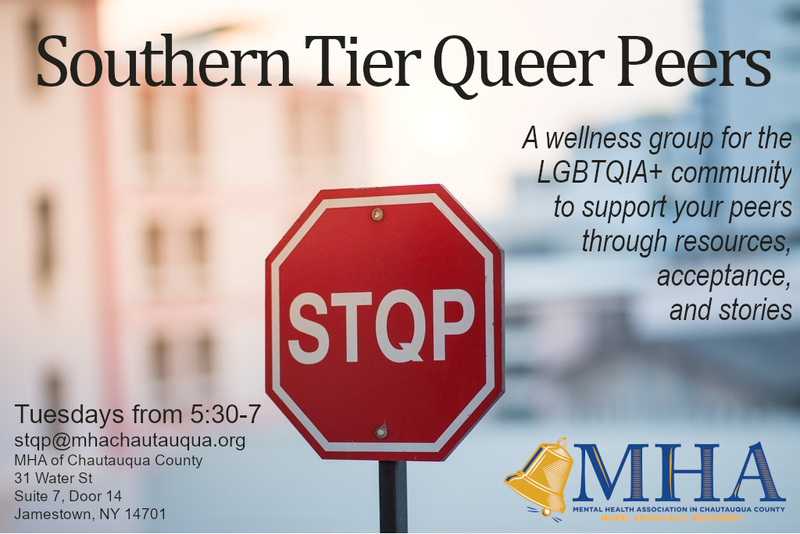 For more information: stqp@mhachautauqua.org.